Why Is The Russian Blue Cat Associated With Royalty? The Russian Blue cat has, for a long time, been associated with royalty because of its regal and elegant stance. These cats have a very demure personality and are reserved, portraying themselves on a pedestal. The Russian Blue cat breed originated in the Russian port of Archangel. As a result it is also known as an Archangel cat, along with Foreign Blue, Spanish Blue, Russian Shorthair and Maltese cat breed. What Is Special About Russian Blue Cats? The most special trademark of these breed of cats is emerald green eyes. This is a fairly new color for Russian Blue cat eyes, which are usually yellow. These cats have very dense fur coats that are very soft and double layered. The undercoat is extremely thick and comes in solid colors of black, white and blue. Although Russian Blue breed of cats have a muscular body, they are not heavy. 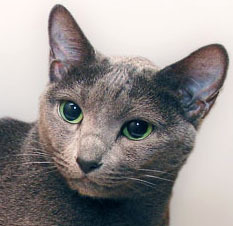 Russian blue cats have almond-shaped eyes that are widely spaced, and their ears are pointed. Their silhouette is slender and graceful. They tend to weigh anywhere between seven and twelve pounds, and have a lifespan of around thirteen to fifteen years. Russian Blue cats make great indoor pets because they are the least destructive of all cats. They tend to be very cautious when it comes to new things, so be wary of changing its environment and introducing it to strangers. Regular brushing of their coats is needed for them to remain lustrous and healthy. Apart from that, they are easy to care for. Yeah! Russian Blue cats have very majestic appearance. All listed traits are very true of the Russian Blue. I have really only ever been exposed to Tabby’s, Bengal’s, Persian’s and Siamese cats. My Russian Blue was a rescued cat from an abused home, and he is the sweetest, most serene cat that i’ve ever been in contact with. He definitely thinks he is the king of his domaine, and we are all his loyal servants lol. He is great around my children and around guests. All other Russian Blue’s that i’ve been in contact with since adopting mine, have the same demeanour as ours. A salute to one of the most wonderful breeds ever! i have a russian blue. loveable and very sweet cats. i cant find what russian blue cats eat!!! Russian Blues eat cat food. Obviously. What else would they eat? Russian Blues eat cat food. I really want a Russian Blue! I dont have a cat but I have looked after one when a friend went on a holiday and I have really wanted one ever since!!!! We just got a kitten that physically looks exactly like pictures of the Russian Blue Cats. BUT, she is anything but serene. HA HA She is 6 months old, and plays constantly. Except at night when she sleeps all night between my husband and I. She loves people, and plays with children wonderfully. She brings her toys to you to throw so she can fetch them. The ONLY problem is her claws and teeth. Likes to bite, not hard to break the skin, but those baby teeth HURT. She will walk by me, then reach out and nip the top of my foot. And when playing she uses her claws to such an extent you get scratched a lot. She has not shown the timidity mentioned regarding the russian blue. Will let anyone pick her up, including the young children. Very very loving. Until she’s ready to play. Then anyone becomes fair play for her claws. Your cat sounds just like ours. Dorian is very friendly to strangers (too friendly; we almost lost him several times) and is very playful. As a kitten he lacked judgement about how rough he could be, but as an adult he tempered his biting. Dorian continues to be very social with people and does not hide when we have visitors. He is an avid hunter. Despite being well fed, we can’t stop him from eating his prey and getting sick. Does anyone have a solution other than keeping him inside?? My blue boy, Leo, is now 3. He is the sweetest, most relaxed, loveable kitty ever. He is not the “typical” blue, as he is very large weighing almost 20lbs. We call him a puppy-kitty because he follows you around, comes when called, growls when someone comes to the front door, just like a dog. He is so relaxed he allows my girls to stroll him around in a babydoll stroller– he loves it! I think my cat is a cross between this breed and some other breed. She’s very cautious of new people and pretty much sticks to who and what she knows. We’ve moved twice since we got her and she hid out in one spot in each new house for almost a month or better before warming up to it. She runs away if you come to pet her too suddenly, you have to let her approach you. When she does, she’s very affectionate. She’s also spoiled and prissy. When we got her we were told she was a “Dilute Calico”. We always thought her jumpy behavior was abnormal and odd, even for a cat, and just assumed she must have been abused before we got her. I had the most wonderful Russian Blue Mix, “Piper Blue”(“Pip”). She had the “smile,” the waterproof dense soft gray coat with the silver “tips” & the almost invisible “ringed” tail, but “jack-rabbit,” powerful hind legs. Every landing took your breath away. She loved her “family,” human & feline, was meticulously clean (she insisted to my 2 males they separate their #1 & #2 into separate boxes), wouldn’t allow furniture scratched (she’d gently bump them away), make sure each cat received quality time with me. She loved to play hard, slept under the covers, very very affectionate. Would run past me, then plop down in front suddenly, roll on her back so her tummy could be rubbed & patted. She liked to be carried with her front paws wrapped around my neck & her back paws around my waist. She was shy to strangers. She was terrified of the outdoors & wouldn’t go near an open door. When she was quite ill with cancer, both “boys” (who worshipped her) licked her from head to tail. She did love being clean! After she died, “Chipmunk” grieved for at least a year. “Pink Floyd” carried her collar to “meals” & to “bed” for months. She had ran her household smoothly, & when she died, it was chaos. Such a great FRIEND! that is a real nice story,we have a Russian Blue Cat and at six weeks he fell from top of our stairs on to a wooden floor and was a sick little boy for a couple of weeks but with good vet care he is now perfect in every way, to any body who would like a Russian Blue cat you could not get a better cat for companion or just a pet we love him, and even though he has cost around $1000 to get better would spend it again as the enjoyment he gives back with his nature and mad antics you would not be without a Russian Blue, Would recommend a desexed male as we have had females but the male is more affectionate. Oh! help! i checked the site you listed and the russian blue kitties are absolutely breath taking… but i do not read, write or speak german. (my father did but he is 10 plus years passed on). I wish to be able to contact these people but … do they speak english, if not … any suggestions? I really was blown away by the magnificence of the pictures of their RB’s. if it helps i am interested in a desexd male. i had a russian blue cat named Rascal…She lived to be 21 years old and she was like my daughter and friend. She was the most loving and friendly cat I ever had. She became my pet when I was I was 11 and she passed away when I was 29. I miss her dearly. I recently got married and I hope to get another russian blue cat in the future. I found a russian blue kitty outside a little tiny shopping mall in Phoenix Az. He had the coat characteristics described and all of the personality traits. He was devoted to me from day one. he slept under the covers with me his arm around my neck pulling me close he would scoot realclose and put his nose to my nose and forehead to mine and stay that way all night. he was gentle and unaggressive with my other cats. he was so in tune with me it was really incredible. all my kitties love me but nothing before or since has ever come close to this bond that he initiated and maintained the entire 10 plus years we were together. He did occasionally sneek out the front door and get lost only 4 or 5 doors down from our apt. He would realize he was lost and sit right where he was until i or my husband came for him. (LIL goobernaut cat) He dropped the habit about 4 to 5 years ago. 2 Months ago i had to put him to sleep because his cance had advance too far for him to be comfortable anymore. He was sweet to the nurse when i took him n that day nuzzlong her and trilling. I miss this cat so much I cannot describe my heartbreak. i am thinking of adopting a russian blue as though i can never be sure of his breed it sounds remarkably like my kitty husband and i wish to have one more relationship that special and close . Sadly as much as i adore all my kitties none can fill the hole in heart. could someone take a look at his pics and ell me if they think he has blue in him. It is very important to me so i adopt an RB if it is the breed specific characteristics (personality) that made such abond possible. He had slate grey pads and russian blue’s supposedly have only mauve pads, everything else seems to coincide…Please email me if you can help identify the possibility of his heritage. When I found him he was immaculately clean, declawed and looked as though he had just walked out the door of a pampere home 5 minutes prior. I posted fliers and pics back then but no one ever reponded and so KarlosAKitty staid with me. Thx broken hearted kitty-widow. do the russian blue cats shed? I have an orange tabby female named Lucy and when she was a year old I adopted my little bundle of mischief, a Russian Blue female named Layla. Lucy was not happy when I came home with a new cat and she hissed and batted at her for about a month. Then they got used to each other and have been fine ever since. If the Russian Blue cat starts out as the dominant cat it may have problems accepting another cat in the house and act out accordingly. But after I’d had Layla for awhile and she didn’t know what it was like to be the only cat and even started giving Lucy kisses. She’s a cuddlebug and isn’t shy around strangers whatsoever. I’ve had plenty of cats since I was a kid, but Layla’s personality is definitely one of my favorites. I’ve had a hard time finding a Russian Blue cattery online and the only one I found was down south and I live in NH and they absolutely will not ship any of their kittens or cats. I’ve had a heck of a time trying to find a breeder too. For as many blue cats as there are out there, you wouldn’t think finding a cattery or breeder would be so difficult. My best recommendation to you is to keep your ears to the ground and see if there might be a cat show within a reasonable distance of where you live. For instance, I live close to UNH and I believe they have an annual cat show. There you WILL meet breeders and people looking to sell kittens and you can get a lot of information. For instance, Russian Blue cats are not the only breed that come in the lovely blue color — quite a few breeds have blue available and you may discover a different breed of cat has characteristics you prefer to a Russian Blue and then discover that the breed also has blue available. Russian Blues have some very “strong” personality traits and will not fit into all families, particularly since they tend to bond to one family member more than the others and if you have a family, your new kitten might not choose you to love the most. If you check your local humane societies, the chances of coming across a blue cat is very high. You might not find one the first time you go, but if you keep checking, the chances of finding a blue cat is bound to happen. Good luck on your search. hi i have a 5/6 month old russian blue, her name is costa, she is super sweet loves us to death and truly the best pet ever. Our best friend also has a russian blue cat, his name is plomo and we are currently cat sitting him for a week. They had already met once. While she bullies, growls and hisses at him, he only wants to play around … is there anything we can do about this. I don´t want to be nervous all week about my cat attacking my friend´s cat or my cat hating me for bringing a visitor, this is the first time i ever have a pet i am pretty naive on cat behaviour … please help me! i love russian blue cat breed . I own a 4 month old Russian blue male named Milo. He can be sweet when he wants to be. He act more of a dog than cat. He likes to bite, claw and growl. He plays with stuffed animals rather than his cat toys. When I get home from work he runs to me crawls up my arm and kisses my cheek. But after about 5 minutes of being sweet hes ready to play. At night he sleeps in his own room. I’ve tried him sleeping in my bed. But he stays up all night pouncing on me and smacking my cheek or clawing my head trying to play with my hair. But he’s a true character and I love him like he’s my child. I adopted a female Russian blue cat named Grettle about a 3 years ago I love her very much and she has been a good cat, but at times she seems stressed out and on edge. I was wondering if this is something that is normal for the breed or if I should take her to see the vet? Help me please! I have wonderful Russian Blue cat. We live in Iceland. He comes and goes out the door as he likes. He is nine years old and is very lovable. My Russian Blue Cat doesn’t like children much but is very relaxed when he is outside, he doesn’t like the neighbors to take him or cuddle him. I got him here in Iceland but i haven’t seen many like him here. i have a russian blue, ive had him for 10 months and now has gone missing . he was a very friendly and playful cat and my children and i love him very much . we r hoping he will return home soon. I really like their blue color on russian blue cats! I have a mix breed Russian blue his name is Mickey. He’s the smartest cat I ever had the honor to own. He’s so playful. He’s my little angel. I lost my 18 and a half year old Blue Birman a few months ago which was very sad. But then for Christmas I was given a desexed Russian Blue boy. It has taken him a few weeks to settle in, but he is already the most affectionate cat I have ever known. He stays in bed with us all night purring constantly. He plays like a lunatic the rest of the time, but isn’t destructive in any way. He is inquisitive but quite shy with it. He hasn’t been introduced to anyone else yet – I have a feeling he might just hide, although if someone offers him a treat, I have a feeling he will always come to get it – he LOVES his food. They are a great breed, with a beautiful nature. He has well and truely made a place for himself in my heart, next to that of my beautiful Birman who will never be replaced. I love my Russian Blue/Tabby Mix but he looks like a russian blue the only thing is his eyes are yellow. He is two years old and my husband brought him home after the death of my beloved cat easy two years ago. My cat is named Ash and he was about 4 months old. I have fallen in love with him and I consider him my son. (My husband and I have no children by choice at this time). Ash has a wonderful temperment and I hope and pray that he lives 20 years or more. We have a beautiful Russian Blue x Siamese female 9 month old desexed cat, and we would like a kitten [ male ] if possible, we live in S.A. and the cat would be indoors, and we do have a cat door, and lock it up at night if it did want to go out, our cat does only for a short time, and wants to come back in, we are elderly and have no others living with us, so the cat would be well looked after, and be one of the family, we are pensioners, so would have a lot of time every day with it. Ron. We had one Russian Blue for 16 years. We named her Sheena because the first day we got her home she acted like she was the queen of the jungle. She was very loyal to us, but stayed away from everyone else. When she went outside she did not allow any other cats near her territory. Miss her. I found my Grey C. in a gas station parking lot. He was 8- 10 weeks old. He is very playful, curious, and gets along great with my 3 chiauhas. He never meows unless my dogs are outside without him, and he only goes out on a long leash. I love him! He’s kinda naughty, and runs everywhere in the house. He’s laid back, but hates loud noises. He’s a joy. He doesn’t like to be held, but enjoys being near me. I am so lucky to have found him! He is absolutely gorgeous with a precious personality! one day when i was walking around the mall with friends i saw a whole litter in the humain society office they were just brought in and were still in the kennel. me being a dog person I NEVER wanted a cat till then.The breed reminded me of my favorite movie Pet Sematary. The very next day I Pawned off my Favorate guitar which was my electric Little Baby Dean pitch black flying V which ran up to 350 used and with broken parts after i exchanged it with a decent Fender. I had gotten enough money after doing the same with my Amp.Not even the next day I rushed to the mall to pick out one of the little beauty’s. When one of the volunteers opened the cage one of them came right to me his name on the card was Tom Tom I knew he was the one i wanted because he sweetly touched his paw to my cheek and played with my head band. I was lucky I got hm for 80 buckes when if anywhere else he would be much more expensive hes matured a little sine then and he is now known as Meleniko. i have what i believe is a russian blue. he was a stray when i moved in, and when it started getting cold out he eased his way into my house.. i was never a cat person, but, an animal lover i am.. i adore him now.. i’ve had him for about 3 years, and he’s unlike any cat i ever knew. he comes in and out as he pleases. he just scratches on the door. if i leave him out for the day, he greets me at my car when i get home.. if i go outside at night alone, he’s right beside me. he loves to cuddled before he goes to bed, and when i get home from work and pick him up, he wraps his arms around my neck and burrows in with his head. he’s very well behaved. he is very social when company comes over. he stands guard on my porch and if another cat walks by, he just stares it down, on guard.. if he’s in a playful mood, he’ll grab your feet as you pass by him. i consider him my watchcat.. his name is pal (being that he was a stray and i didnt know his name). he’s my best friend..